This is what clients tell our partners all the time. But, for a website in a competitive industry, ranking for money terms can be a battle itself. In this SEO case study, I’m going to show you how we were able to get over 800 key terms of the client in the top 5 positions, with increase in traffic, using our white label SEO solutions. Client works in the recreation and touring industry. Their website already has good traffic – with some of their key terms ranking in the first page. The client’s goal was simple: get above-the-fold-rankings, specifically positions 1 to 3. The client’s main keywords were directing traffic only to the homepage instead of the inner pages. Competitors have individual pages and enough quality content to talk about the keywords, while the client only has the homepage to rank for the same set of keywords they are targeting. 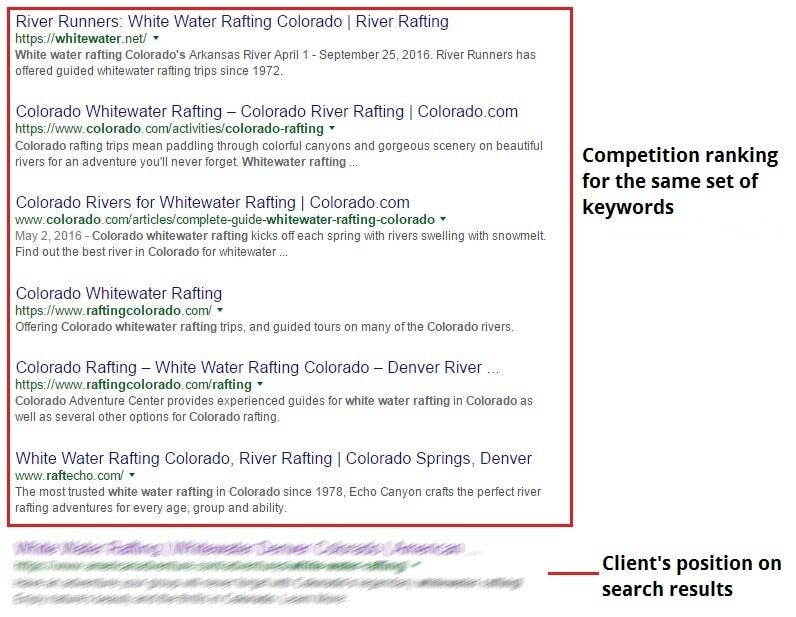 When we checked the website, 75% of the pages that are contextually relevant to the target term “white water rafting Colorado” are linking to the homepage. While the client has an existing page for the target term, only 25% of the links point to this page — which explains why the white water rafting page is only in position 7. Because the homepage is the only one ranking for their money terms, the competition is taking over most of the online real estate above-the-fold. The entire website structure was too cluttered and lacks organization, hindering the site from ranking for the target term. The content needs improvement to provide contextual relevancy to the target keywords and pages. The whitewater rafting page that is contextually and syntactically relevant to one of their main target keywords is too far down the website structure, which explains why it’s not getting enough traffic. Initially, the white water rafting page was under the page for their adventure packages. We moved the page up to the second tier and created content that will include the key term. We organized the pages under the adventure packages and made sure they are in the appropriate categories. The content for the Why Choose Us page was transferred to the homepage to serve as one of the main USPs of the client. The new site structure allows the pages on the succeeding tiers to earn authority from the homepage, while organizing the pages to enable a more logical and contextual connection for each page’s content. As most of the equity of the keywords lies on the homepage, the inner pages are being overshadowed and losing traffic from what’s supposed to come from the target keywords of the website. With the new site structure, we were able to address inner page linking so the homepage does not cannibalize all the rankings for the target keywords. Because we needed to get the white water rafting page ranking, we split the target keyword “white water rafting Colorado” between the homepage and the inner page. We used long-tail variations of the keyword on the homepage, while the exact matches of the keyword went on the inner page. The new pages we created, as well as the existing pages that provide contextual support to the target term, were linked to the white water rafting page. The homepage has considerable amount of content, but it lacks quality content to support the unique selling proposition of the company. We didn’t want to affect the current rankings of the website, so what we did is take some of the existing content from the homepage related to white water rafting and place it on the new white water rafting page. Instead of having the homepage explain all the information about the client’s services, we populated the new pages with content that are relevant to the intent of the keywords they are targeting. Some of the content on the inner pages were re-written to address keyword stuffing. Increase the traffic to nearly 8,000 from the initial 2,500 monthly visitors the website is receiving, showing a growth of almost 300%. Over 800 keywords of the clients from the initial 300 are now in the top 5 positions. We were able to rank 50 terms on positions 1 to 3, including the main keyword targets of the client. With increase in organic rankings, the client had less reliance on ad spend. So, were we able to achieve the client’s goals? A big YES! The strategy may appear simple — because it really is! It’s all about finding the right opportunities on the website, looking for the pain points, and implementing the right methodology. Needless to say, the client was happy with the results — and this means another satisfied business for our partner. This is just an example of how SEOReseller is able to deliver value for our partners. If you want to see our methodology in full action, call our toll-free number at 1-800-250-6106 or schedule a kickstart call now. We’ll be happy to share our formula to help your digital business grow. Itamar has been on the net since the days it was still in black and white. Born and raised in Israel and now living in the Philippines, founder of SEOReseller.com and recently launched Siteoscope.com.